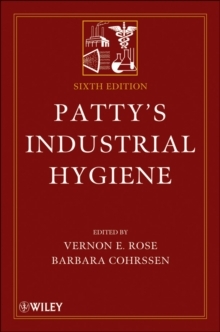 Since the first edition in 1948, Patty's Industrial Hygiene and Toxicology has become a flagship publication for Wiley. In the course of its nearly six decades in print, it has evolved into a standard reference for the fields of occupational health and toxicology. The volumes on Industrial Hygiene are cornerstone reference works for chemists, engineers, toxicologists, and occupational safety personnel. Since the 5th edition was published, the field of IH has changed with personnel often working for multinational firms, self-employed, at small consulting firms. Their environment has changed and expanded, and thus also the types of information and resources required have changed. The traditional areas of interest to occupational health and safety professionals include anticipation, recognition, evaluation and control of potential hazards. In addition to these, the 6th edition provides information and reliable resources to prepare for natural disasters, exposures to biological agents and potential acts of terrorism.